Even though I knew they would only use a snippet from this I promised not to post it until the article was published. 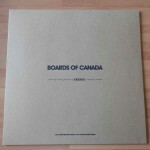 — from the tone of the blog post, it sounds as if you knew you were getting a copy of the BoC record. Is that true? And if so, how did you know? I had no idea. There was a huge expectation from others that we would get a copy but I’d actually been speaking to Warp in the previous weeks about repressing the BoC vinyl and there had been no hint of a new album never mind that we would be involved. — What are you plans for the record? keep it for your own collection? Sell it? Give it away? There was a yellow post-it sticker on the record saying sell me. It was sold to the first person who came in after it arrived. The barcode is for a “music has the right to children” CD so we sold it for £7.99. I’d actually had a conversation with the young lad who bought it about Warp (after he had bought an Aphex Twin 12″ and then a Grizzly Bear album the next week) about how Warp had kindly done a poster campaign in Edinburgh before Christmas tagging Avalanche so it seemed appropriate. — What do you make of all of the hullabaloo stirred up by these releases and the upcoming BoC record? I sort of saw it coming after the Godspeed release in terms of other bands upping the ante. My Bloody Valentine made a mess of it on several levels while Nick Cave left us all wondering for a few days after announcing and linking to his website before announcing a distributor and an exclusive vinyl for independents. — Any thoughts about the young man who is selling his copy on eBay? I’m confident the guy who bought our copy won’t do that. He has offered it back to the shop to display which we may take him up on. As for selling on eBay it is hard to judge someone when so much money is involved. — Do you think we’re going to be seeing more promotional efforts like this in the future? As I said about MBV and Nick Cave I think bands will continue to find new ways to announce their albums hopefully not too much at the expense of the shops that have supported them for so many years and helped them build up their fan bases. Godspeed sold their album at gigs first, MBV gave their album to very few shops indeed and many shops took the stance that it was not their job to chase after the band asking for stock. Nick Cave announced a box set only from his website while giving independents a limited LP + 7″. BoC have given independents a limited CD with 3 art cards which is appreciated I’m sure. Promoting an album in an innovative way is one thing. Trying to maximise D2C sales is another !